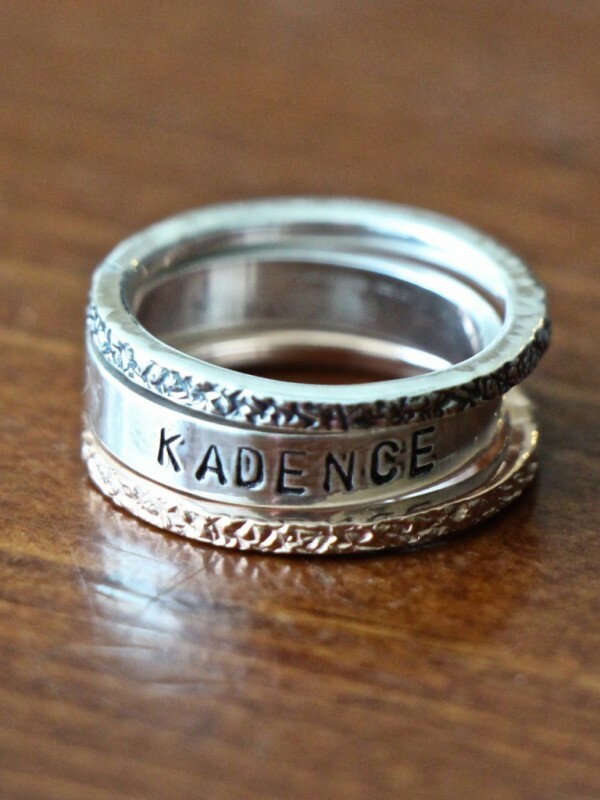 Sterling silver stackable name ring in mixed metals makes a wonderful mothers ring, graduation ring, anniversary gift or a “just because” gift to cherish a lifetime! Sterling silver ring set includes three rings- available in sizes: 6, 7, 8, 9. Hand stamped band measures 4mm wide- personalize with up to 12 characters. Two textured bands measure 2mm- available in rose gold plated, gold plated, sterling silver and oxidized sterling silver. Categories: Fashion Jewelry, Gifts, Hand Stamped Rings, Rings, Stackable Rings. Put one ring choice in each box below. Tags: hand stamped, mixed metal ring, mothers ring, name ring, stacking ring, sterling silver. “I carry your heart in my heart," inspired by E.E. Cummings. "Cherish My Mom," personalized with a name or date. "Mommy of An Angel," personalized with a name or date. "Forever in my Heart," personalized with a name or date. Sterling silver volleyball charm makes great volleyball jewelry great gift for your favorite volleyball player, team or coach. Add a personalized necklace hand stamped with a name, number, initial or favorite team. Sterling silver charm measures 12mm.